I picked this book up because of the slogan that was pitched to me: “Live by the sword … Die by the sword … No matter how often the sword yells at you.” Seriously, Squinks, you’ll get sucked in because of the talking sword, but you’ll stay for the adventures. 1. Odo and Eleanor are great friends, and that, for me is the mark of a great story. Odo is thoughtful and patient, but he doesn’t necessarily want to be a knight. Eleanor, on the other hand, is also considerate, but a little more impulsive, and has always wanted to be knighted, to take after her mom. It’s a great set-up for some excellent conflicts in the story. 2. Biter is funny! He’s sarcastic and quick-witted, but pragmatic and to the point, too. At many times throughout the story, I actually thought that there were three people travelling north. Then I remembered that while Biter is a great character who moves the plot along and is instrumental to the action, he’s just a sword, bobbing his way alongside Sir Odo and Squire Eleanor. 3. I love the names of the villages and townsfolk that Nix and Williams came up with. They definitely give me nostalgia for my university classes where we learned about various Alfrics and Æthelreds. I read the ARC version of this book, which didn’t have the illustrations in the final text, but I’m happy to say that the published book has a map for endpapers! I love maps. It’s so much easier to appreciate Odo and Eleanor’s adventures when you can see (not just imagine) how far they travel. 4. I like that lady knights are not just possible in this fictional world, but commonplace. And not just knighthood through marriage or royal blood either … the authors depict ladies as knights with the intent to combat enemies and defend honour. 5. I don’t know if there’ll be many more books in this series, but I sure hope so. There is still so much growing up to do by Odo, Eleanor, and even Biter whose recollection of his own story is a bit fuzzy. I want to know more about Odo’s siblings and Eleanor’s mother. I want to encounter Toland, Master Thrytin, and the urthkin again. Mostly, I want more adventures, and I want to see how the friendship develops between Odo and Eleanor – not necessarily romantically. It’s always interesting for me to see how a character changes alongside another character with whom he/she has been friends since childhood. I can only imagine the kinds of conversations the two will have about the best routes to travel, the most efficient ways to parry a blow, and the need to wash every day (Odo). Thank you, Scholastic Canada, for sending me a copy of Have Swords, Will Travel in exchange for an honest review. If you like reading stories with strong and sweet heroines, family relationships, and life after a war, I’m sure you’ll love Lucy Strange’s The Secret of Nightingale Wood. 1. It’s been nearly 100 years since the Great War ended, and most of my students AND the people around them are far removed from the effects of the war. But it’s called the Great War because it’s the first time that so many people from so many lands and across so many fronts have been affected by a mutual event. There are lots of great stories about soldiers before, during, and after battles, including one we read in French class called Journal d’un soldat. But some of my favourite stories are about the people at home – mothers, sisters, and friends, awaiting news of their loved ones, and rebuilding their lives upon their loved ones’ return or … permanent leave. The Secret of Nightingale Wood reminds you of how war often rips apart families. 2. Henry is a lovely, authentic heroine. She’s at the great age where she’s stuck between having true independence in her teenage years and enjoying enough freedom to think and feel the way she wants to, regardless of how other people tell her to behave. She loves her little sister, Piglet, and if I didn’t like Henry for anything else, I’d respect her for that. What a great older sister to have. 3. Henry is brave but not reckless. I would have been too scared to enter the woods, so I applaud her courage in doing so, but she also recognizes when to be on her guard. She takes calculated risks, including visiting her mother who’s been locked in a room, if need be or if her heart can’t take it any longer. She is also wracked with guilt that her last conversation with her brother, Robert, was a fight. I don’t know if this is what makes her push herself to be brave, but she tries really hard to keep her family together once her family seems to be ripped apart. 4. I like that Henry’s plan towards the end of the story isn’t completely out of this world. I don’t like endings that employ deus ex machina or have some sort of implausible, neatly tied dénouement, so I like that Henry’s solution isn’t too easy to be believable. 5. I was a bit annoyed with Nanny Jane. Her heart seems to be in the right place, but I feel like she bends too easily to forces outside Hope House. If Henry and Piglet are her primary charges, why would she let others’ opinions sway her from doing her job? 6. Dr. and Mrs. Hardy – ugh. Dislike both of them with a sneer. And Dr. Chilvers, too. Aren’t the best characters to hate the ones you know smile with duplicity (even though you can’t actually see them smiling)? 7. Moth is a lovely, bittersweet character. She’s caring and motherly towards Henry, but sadness and pain just oozes out of her. I’m glad that she has small bits of beauty in her life. I think Henry saves Moth just as much as Moth saves Henry. I can imagine them having a nice, long friendship. 8. I let my book fall open on a page, and it happened to be on one where there is a letter set in a different font from the rest of the story. The final copy of the book may have this letter in a different font than the ARC I read, but the font – Janda Elegant Handwriting or something remarkably similar – has been one of my favourite ones for as long as I can remember. It’s even the font I use for the header of my blog, which tells you how much I love it. I guess I knew from the moment I saw that letter in the book that this was going to be a good, heart-tugging story. 9. Teachers/parents, there are many lessons you can do with this novel. The biggest one is a discussion on the effects of war and death on an entire family and community. Right from the beginning, we know that Robert, Henry’s older brother, has died, and with him, bits of their parents have died, too. We also find out later on about another boy who has died. The two deaths, though from different causes, rock two families and a community. This could be a teachable moment in terms of the ripples people make. Also, there are tons of allusions to classic lit, which would make a great side project. 10. The Secret of Nightingale Wood is set to pub on October 31. 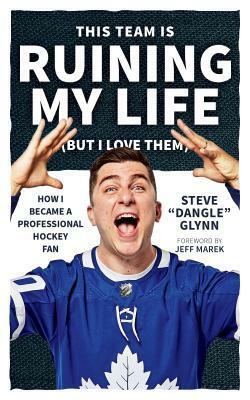 You definitely want to put this on your bookshelf! There’s so much heart in this story. Thank you, Scholastic Canada, for sending me a copy of The Secret of Nightingale Wood in exchange for an honest review. 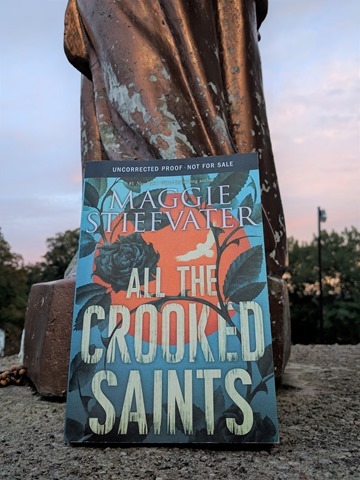 If you’re in the mood for a tale full of magic and mystery, Maggie Stiefvater’s All the Crooked Saints may be just what you need! 1. Okay, Squinks. This is my first Maggie Stiefvater book. I know, right? So many of you have suggested that I read The Raven Cycle series, and I just might pick it up, knowing how great her writing is. 2. Here is a thing I felt after reading a few chapters of All the Crooked Saints: This is not the book for me. Here is a thing I felt on the last page of the book: Boy, am I glad I stuck it out. 3. I like magical realism, and I’d definitely describe this story as such. But this wasn’t the magical realism I expected. There is a priest with a coyote head, a snake entwining twins, and a girl who, like Echo, can only speak when spoken to, repeating the very same words she is told. If I had known that from the very beginning, I may not have picked this book up at all. So if you’re into that kind of stuff, you’ll have a lot of fun with this book. 4. What kept me going even after I realized that the elements of the story weren’t quite what I expected was Stiefvater’s incredible writing. She has such a way with words and telling life truths that I got lost in her magical turns of phrases, and I just kept on reading. Her writing prowess is reminiscent of J.K. Rowling’s own pen wizardry. They’re both so quotable, so authentic. 5. Once I got the dramatis personae all figured out, it was a lot easier to get into the Soria family’s and the pilgrim’s plights. Beatriz, Joaquin, and Daniel have such a close bond. It was great to see that among cousins and among people who are quite different from one another. The relationship between Antonio and Francisco was really interesting. How could a couple get that way when they obviously love each other so much? The pilgrims all have very intriguing stories, too. I was especially enamoured by Marisita’s back story, which I’m glad Stiefvater reveals. I also like the relationship that develops between Tony and Pete – strangers who become friends because of circumstances. By the end of the story, I was rooting for all the Sorias and pilgrims to get what they needed … not just what they’re looking for. 6. Teachers, there are a lot of things you can do with this book in school. Lots of themes pop up throughout the novel, especially ones about family, friendship, and courage. The title might seem like this is a super-religious book, but even without knowing much about Catholicism or saints or caring about any religion at all, readers will still enjoy the plot. If I were to pick this book up as a text for a class, I’d definitely do some explorations on character POVs, a big discussion on metaphors and allegory, and a lesson on the writer’s craft, using Stiefvater’s fine writing as an example. All the Crooked Saints in exchange for an honest review. I don’t think I’ll ever not like a book written by Vikki VanSickle, and The Winnowing is no exception. This is her first foray into sci-fi, and it definitely had me wanting more. 1. I bought The Winnowing without knowing what the book is about. That’s how much I trust VanSickle in her ability to tell a great story. I’ve read all of her other books, and the one thing that ties them all together is that they are written with so much authenticity … I almost believe that her characters are real. Marivic Stone is loyal, curious, and courageous. She’s your typical teen, but when the people in her life are threatened or hurt, she does what she can to make sure the good guys win. But she’s also flawed in that great way I love about pre-teens and adolescents. She, like other great MCs, wants so badly to help that she almost trips over herself in her desire to do something even without a fully formulated plan. Marivic (a great name with roots I’m very familiar with) feels so many emotions, and you just can’t help but cheer her on. 2. As an English teacher (with a specialist degree in linguistics), I LOVE VanSickle’s word play and allusions throughout the novel. She has created a story with homages to or hints of The Giver (Dr. Lowry and just generally the dystopian setting), Ender’s Game (the Kesla), and Brave New World (Somnease and the in/fertility issue). Add to that references to J.J. Abrams, Gene Roddenberry, Krypton, and the X-Files (I’m guessing, since the setting is New Mexico, but as I haven’t actually seen any X-Files episodes, I can’t be sure …), and you’ve got a treasure trove of bread crumbs left for conspiracy-loving readers. I’m sure there are some other sci-fi-specific references that flew by me. 3. I love the banter/arguments/fights between Kamal and Marivic. I’m sure Marivic hated them at first, but it’s just so much better to have scenes where the two principal players despise one another. To his credit, Kamal slowly becomes a team player, even displaying a bit of sympathy towards Marivic at some point. 4. This book reads like it’s meant to be a standalone, but I could definitely see there being a follow-up to explore the stories of Ren, Abbott, and even Gumps. VanSickle’s developed the other characters enough to keep her readers interested in their back stories. 5. In general, I wouldn’t put sci-fi stories very high on my list. But even though this book is very clearly steeped in the sci-fi genre, what shines more are the topics of friendship, growing up, and accepting who you are. Marivic and her friends (and non-friends) are tested in terms of their loyalty to one another, obsequiousness towards authority, and accepting their differences as strengths rather than weaknesses. Because of this, The Winnowing can absolutely be read by anyone … even those who aren’t fond of Mulder and Scully. 6. Teachers, Vikki VanSickle is a wonderful storyteller and read-aloud artist. If you get the chance to have her visit your class/school, do it! Your kids will love listening to her read from her novel (picture above taken during her reading at the Word on the Street festival), and they may even be encouraged to put pen to paper to write their own stories.